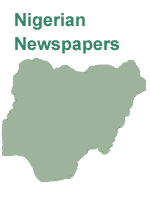 List of Nigerian newspapers, news sites, news agencies, as well as top radio and TV stations. Below is a list of Nigerian newspapers that have national circulation. There are some regional print newspapers also included in the list. Leading daily newspaper in Nigeria. It is one of the most widely circulated Nigerian newspapers. Nigerian newspaper published by Vintage Press Limited. The newspaper published by the Guardian newspapers limited. Daily newspaper based in Abuja with national circulation in Nigeria. Daily broadsheet newspaper published from Lagos and Abuja. Nigerian newspaper published by the Sun Publishing Limited. Daily newspaper published by Independent Communications Network Limited (ICNL). P.M.
English-language newspaper based in Ibadan, Nigeria. Daily newspaper published in Nigeria's capital Abuja. Nigeria’s daily sports newspaper by Complete Communications. Daily business newspaper in Nigeria, headquarters in Lagos, Nigeria. The Daily Times was first printed as The Nigerian Daily Times in 1926. The newspaper currently published by Folio Communications. Port Harcourt based newspaper published by Rivers State Newspaper Corporation. Tabloid format newspaper based in Osogbo, Osun State of south-western Nigeria. Benin City based English-language newspaper. Leading newspaper printed simultaneously from Lagos, Abuja, Ogbese, Kano, Owerri, and Maiduguri. Newspaper published in Port Harcourt, Nigeria. The newspaper published by Network Printing and Publishing Company. Daily newspaper based in Lagos. Nigerian online newspaper covering business, jobs, education, politics, sports, and more. Online community of international reporters and social advocates. Nigeria's major news and media TV channel. News Agency of Nigeria was founded in 1976 by the Nigerian Government. It is the leading news content provider for Nigerian newspapers. Nigerian news site covering latest on politics, business, sports, national news and more. Online news service based in California, USA.